In a previous post, a commenter asked an off-topic question. I try to focus the comments section on the topic at hand, but the question is an important one, so I decided to answer it as a separate article. The commenter is well aware that I think random processes cannot produce biological information. He included a link to an article by Dr. Fazale Rana in which Dr. Rana makes the claim that a recent study demonstrates that biological information can be produced by random processes. Obviously, the commenter wanted my take on the article. Before I comment further, I want to make it clear that Dr. Rana has probably forgotten more biochemistry than I have ever learned. I have a lot of respect for him and am a big fan of his latest book. He and I disagree on some issues, but the issues on which we agree are far more numerous and far more important. This particular issue, however, represents one of the former. While I think the difference in our positions is largely semantic, it is important and worth defining. In the article, Dr. Rana reports on a study1 that was published in the Proceedings of the National Academy of Sciences of the United States of America. In the study, the authors compared the binding pockets of all known proteins in nature to a database of randomly-generated peptides (molecules that are very much like proteins but not large enough to be considered proteins). In order to understand the results of the study, you need to know what a binding pocket is. A protein is a large molecule, but the workhorse of the protein is typically called its active site. When a protein needs to modify a molecule in some way, it attaches itself to the molecule at its active site. This active site is held in a region of the protein called the binding pocket. So the binding pocket is the area on the protein that contains the active site. An example of a binding pocket is given above. The drawing gives you a simplified view of a protein called phenylalanine racemase, a good example of a protein that is used in a wide variety of living organisms. The star points out the binding pocket. In the study, the authors found that there were remarkably few varieties of binding pockets found in all the known proteins, and that all those pockets were able to bind (at least in some way) to something in the randomly-generated set of peptides. The conclusion, then, is that random chance could, indeed, produce biologically-active proteins. After all, if randomly-generated molecules could bind to the binding pockets of the known proteins of life, then those known proteins of life could also be randomly generated. To me, the problem with such reasoning is rather obvious. Look at the drawing again. Notice how small the binding pocket is compared to the protein as a whole. 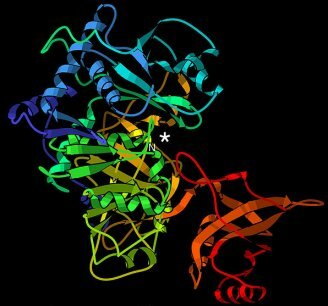 While the binding pocket is an important part of the protein, it is not the only important part. I could easily create a protein that has the right binding pocket, but all that means is it will bind to the molecule in question. But once it binds, what will it do? Will it bind to and destroy the molecule? Will it coagulate with other proteins that have bound to other molecules and make a useless mess? Will it bind to the molecule and activate a function that will cause a destructive reaction to occur? Will it promote the reaction that the cell needs the molecule to undergo? What happens once the protein bonds to the molecule depends on the rest of the protein. …the overall prevalence of sequences performing a specific function by any domain-sized fold may be as low as 1 in 10(77), adding to the body of evidence that functional folds require highly extraordinary sequences. In other words, to produce a biologically-functional protein by random processes, the odds are one in 1077. That is clearly beyond the reach of chance! Now I said that the difference between Dr. Rana’s position and mine is probably mostly semantic. In his article, he goes on to say that while biological information can be produced by random processes, the algorithmic information necessary for the biological molecules to function in the context of the cell is beyond the reach of chance. Perhaps the rest of the protein is what provides the “algorithmic” information. If that’s the case, then we are essentially saying the same thing. In my mind, however, the ability for a protein to bind to another molecule has little to do with biological information. It is necessary for the protein to do its job, of course, but it takes a lot more than binding to get the job done! Unless the protein can actually use its binding ability to do a biologically-helpful task, it contains no biological information. Thus, I don’t see the relevance of this study to the issue of biological information. However, the study does have relevance. Many drugs work by binding to a specific protein in order to inhibit its ability to do its job. Since this study indicates that there are relatively few binding pockets in biological proteins, this indicates that when I make a drug that binds to one protein, it probably will bind to many other proteins. As I see it, then, the main conclusion we can draw from this study is that drugs which bind to specific proteins probably will bind to lots of other proteins, which means that such drugs will have the possibility of several unintended side effects. It is a bit off-topic, but I had a question regarding the theory of evolution and its proponents’ hypothetical time-line. I heard someone comment on a video [Bill Nye (big surprise! )], that the asteroid which supposedly caused the extinction of the dinosaurs also caused the extinction of all land creatures which didn’t have a habitat which naturally protected them (i.e. ground-burrowing creatures). If that’s true, the process of evolution would have been set back a long way. According to the best models of evolution, would that even leave enough time to develop the current range of creatures on the planet? I’d appreciate any thoughts you have on this topic. Thanks for keeping up this blog! Hi Enoch. I am not sure if you misunderstood what Bill Nye, the Anti-Science Guy said, or if he really doesn’t understand the hypothesis he is trying to promote. In any event, no evolutionist thinks that the asteroid impact which supposedly killed all the dinosaurs caused the extinction of all land creatures that didn’t have a protective habitat. They think the asteroid impact caused a lot of damage, but the majority of its killing effect had to do with how it changed the earth’s climate. They think that the asteroid impact put all sorts of dust into the air, blocking a lot of the sun’s light and cooling the planet. The blocked light caused a lot of plants to die (especially the species that were not very adaptable to low-light or cool conditions) and lots of animals to die (such as those that couldn’t deal with the cooler temperatures or those that relied on the plants that were not very adaptable to low-light or cool conditions). In the end, estimates vary, but most paleontologists think the asteroid caused the extinction of about 15 percent of marine families and 20 percent of land vertebrate families, which includes the dinosaurs. However, according to evolutionists, there were much worse extinction episodes than this. For example, the worst one is supposed to be the one that happened about 250 million years ago. It is called the Permian-Triassic Extinction Event, and it was supposed to involve 70% of land animal species and 95% of marine species. There are other supposed extinction events as well, including the Ordovician-Silurian Extinction (about 440 million years ago), the Late Devonian Extinction (About 360 million years ago), and the End Triassic Extinction (about 200 million years ago). In each of these supposed events, many species went extinct. These kind of events don’t set evolution back, however, at least not in the minds of evolutionists. Each extinction event would create all sorts of open ecological niches waiting to be filled. Since evolutionists believe (against all evidence) that animal and plant genomes are infinitely changeable, they just believe that random mutations produced all sorts of new innovation, and since there were so many open ecological niches to fill, natural selection was able to preserve all the useful mutations, since any creature that could even partially exploit the new ecological niches would be significantly more likely to survive. Time has never been an issue for evolutionists, because they don’t bother to worry about it. We know that there isn’t even enough time for humans and apes to diverge from their supposed common ancestor. However, evolutionists can always claim that random mutations were much more prevalent in the past. Add this to natural selection being more efficient when lots of ecological niches can be filled, and you have the perfect, untestable explanation to allow for the repeated extinction of organisms and their subsequent rapid evolution. By the way, have you ever considered making a series of short, educational Youtube videos on young-earth and creationism science? I know they’d be a hit with a lot of homeschoolers and Christians. Thanks again! I appreciate all your work in education! Yeah, that’s pretty much nonsense. It’s not surprising, since he really isn’t very knowledgeable about science. Rather than “red hot rocks” surrounding earth, it was thought to be a cool dust cloud. Rather than “cooking” the earth, it was supposed to cool the earth. I think he is confused because the initial impact is thought to have caused rocks to fly up into the air and then fall back to the ground. They are thought to have been very hot when they hit the ground because of friction with the air, so the model does include a “rain” of hot rocks. However, there is just no way this “hot rock rain” could blanket the world, as he describes. Also, it certainly would last for weeks, as he describes! I am not really big on videos. I understand their value, but it’s just not my thing. I personally prefer to discuss science in the written word, where I can be more precise and also document my statements with references. I guess that’s just the result of my scientific training. A College Education Makes You MORE LIKELY To Retain Your Faith “Ancient” Bacteria Use Quantum Mechanics!